The M14 rifle, formally the United States Rifle, Caliber 7.62 mm, M14, is an American selective fire automatic rifle firing 7.62x51mm NATO ammunition. Although largely superseded in military use in the late 1960s by the M16 rifle, it remains in limited front line service with the United States Army, Marine Corps, Navy, and Air Force. It also remains in use as a ceremonial weapon. 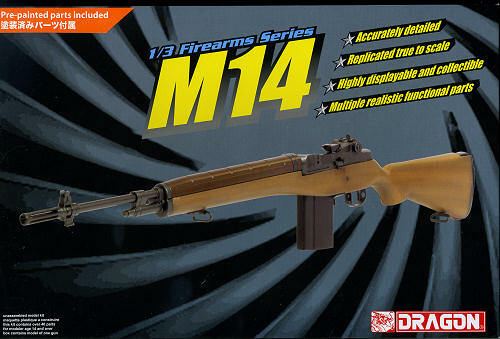 The M14 also provides the basis for the M21 and M25 sniper rifles. It was the last so-called "battle rifle" (a term applied to weapons firing full-power rifle ammunition) issued in quantity to U.S. troops. This is another of Dragon's large scale military weapons kits. This one comes on several sprues of plastic, with the stock already painted. There are not a ton of parts with this, so construction should be rather quick, even taking the time to paint some of the other pieces. 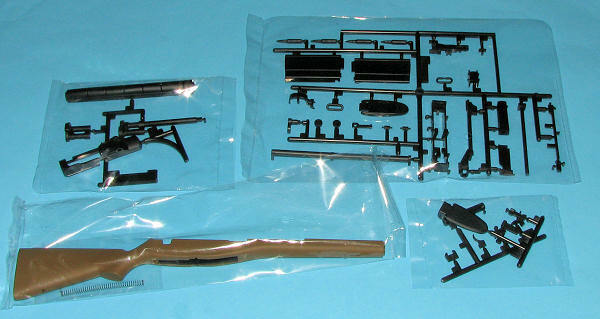 As you can see from the photo of the sprues in their sealed bags, there are four smaller sprues, one large one, the gun stock and a long spring. This spring is for inside the barrel as the gun has realistic bolt action as well as a working trigger and removable magazine. There are two bullets. The instruction sheet is minimal as you'd expect with a painting guide and simple construction diagrams. There really isn't much more to say. It looks like an easy build and if replica guns are your thing, this should be a nice addition. I have also seen where they are selling some of these ready built, so you may wish to explore that route. Thanks to www.dragonmodelsusa.com for the preview kit. Get yours at your local store or on-line retailer.